Who is Kelcy Warren, the Texas Billionaire and Folk Music Fan Behind the Dakota Access Pipeline? | Democracy Now! Who is Kelcy Warren, the Texas Billionaire and Folk Music Fan Behind the Dakota Access Pipeline? NERMEEN SHAIKH: We turn now to look at the Texas billionaire behind the Dakota Access pipeline: Kelcy Warren, the CEO of Energy Transfer Partners. Described by Bloomberg as “among America’s new shale tycoons,” Warren is personally worth $4 billion. He has become a major donor to the Republican Party. During this election cycle, he gave over $500,000 to a super PAC backing former Texas Governor Rick Perry. He also maxed out his donations to House Speaker Paul Ryan, House Energy Chair Fred Upton, House Majority Leader Kevin McCarthy and Senate Energy and Natural Resources Chair Lisa Murkowski. Kelcy Warren owns a small music label and recording company, and is the founder and driving force behind the Cherokee Creek Music Festival in Texas. 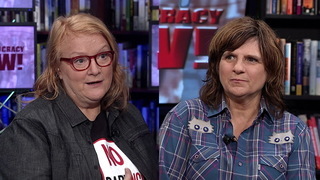 Later in the show, we will be joined by the Grammy Award-winning Indigo Girls, who have written an open letter to Kelcy Warren. AMY GOODMAN: We also invited Kelcy Warren to join us on the show but did not receive a response back. So, Sue Sturgis, you wrote this very interesting piece in Facing South. Can you talk about who Kelcy Warren is? SUE STURGIS: Kelcy Warren is a native of East Texas, and he studied civil engineering at the University of Texas at Arlington and went to work in the gas industry. His father, interestingly enough, had been a field hand for the Sun pipeline, which Kelcy Warren’s company now owns. He worked his way up through the industry. And in 1995, he co-founded Energy Transfer with Ray Davis, who you might know as the owner of the Texas Rangers baseball team. And then it was in 2007 that Warren became the co-CEO and chairman of the company. NERMEEN SHAIKH: Well, can you tell us a little bit about this company that he co-founded in 1995, Energy Transfer Partners? SUE STURGIS: Yes. Well, as you mentioned in the introduction, you know, he’s been called one of America’s new shale tycoons, but it’s important to note that his company isn’t actually drilling for the oil, but rather moving the oil around. So that’s what they do. And they currently own 71,000 miles of pipelines in the United States. NERMEEN SHAIKH: Can you explain what that means, moving oil around? SUE STURGIS: Well, once we get the oil out of the ground, it’s become really important to get it to where it needs to go. And the pipeline is the way that Kelcy Warren has made his fortune, doing that. AMY GOODMAN: And can you talk about the contributions he has made? SUE STURGIS: Yes. That was the angle that I was particularly interested in looking at. I thought it was interesting that Chairman Archambault talked about the importance of considering investors in the pipeline. And I thought it was important also to look at the investment that Kelcy Warren and his company has been making in politics over the years. He’s donated millions of dollars to politics at both the federal and state levels, and much of that money has gone to Republican politicians. During this election cycle, as was mentioned, he’s donated at least $500,000 to Rick Perry’s presidential campaign. And since the primary, he has donated at least $100,000 to organizations that support Donald Trump. Then, also, at the state level, he has been a big supporter of Governor Greg Abbott of Texas, and last year Abbott appointed Warren to the Texas Parks and Wildlife Commission. And at the same time that Kelcy Warren is making campaign contributions, Energy Transfer Partners has its own PAC that’s also making contributions. So you have this sort of synergistic thing happening between, you know, the contributions, the investments from Warren and from the company, and politics. And during this election cycle, Energy Transfer Partners has invested about $300,000. That’s what we know of so far. Of course, these are moving figures; we’ll probably find out more after the election, when all the reports are in. But about $300,000 to federal candidates, and that’s primarily House and Senate candidates. And then the company is also making investments in state politics, about $100,000 this election cycle so far. And one of the things that I thought was interesting in my research is that, in recent years, really starting last year, he’s begun—well, the company has begun investing in politics in the Dakotas. So we’ve seen at least $10,000 going to political organizations in both North Dakota and South Dakota, and that’s gone primarily to House—state House and state Senate Republican organizations. AMY GOODMAN: So, now talk about his role in the folk music scene in Texas and around the country. Talk about the Cherokee Creek Music Festival, his record label, recording company. SUE STURGIS: Well, in 2007, which was the year that Warren rose to co-CEO and co-chairman of the company, that was really a watershed year for him and a lot of his activities. That was also the year that he founded Music Road Records, which is his independent record label based in Austin. And he also founded a charity that year called Cherokee Crossroads. And it’s the music festival that he then founded that actually funds the charity. So, that’s how that works. The Cherokee Creek Music Festival raises the funds that then goes to Cherokee Crossroads. And that primarily funds children’s causes and also local service organizations. AMY GOODMAN: So it’s called Cherokee Creek, and you heard me asking Chairman Archambault how interesting the Cherokee Creek Music Festival, the Dakota Access pipeline—you know, all Native American words. And yet we see what’s happening to Native Americans who are facing off against the building of the Dakota Access pipeline, being met with pepper spray, attack dogs, rubber bullets. SUE STURGIS: Yes, that’s true. I believe the name comes from the community that he has a ranch near. It’s actually called Cherokee, Texas. So, there’s some irony there. AMY GOODMAN: And Jackson—the significance of Jackson Browne, when it comes to Kelcy Warren’s music tastes? SUE STURGIS: Well, Kelcy Warren himself is a guitar player, and Jackson Browne is really one of his musical idols. And so, they have a close relationship, I guess you would say, although, of course, Mr. Browne is not happy with what’s happening right now. But, yes.